For Discover White's latest outing we introduce F.E.B. with a full on trancer aptly titled, The Danger. A huge throbing bass and massive kick sets the tone for the track which drives towards the breakdown with intent. When it drops the melody lifts into the peak time stratosphere before kicking back in with menace. Subtle melodic lines pepper the track throughout and compliment the main hook perfectly. If you like your bass big - then look no further! 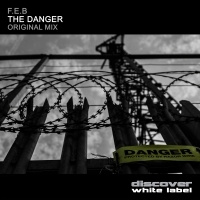 'The Danger' is available now from Beatport and iTunes.